Like any precious heirloom, pearl jewelry requires some care to preserve its freshness and beauty. The following suggestions will help you keep your pearls looking their best. As an organic gem, pearls are vulnerable to chemicals found in cosmetics, hair spray, and perfume. To preserve your pearls' luster, always put on your jewelry after applying make-up and styling products. Pearls can also be harmed by perspiration. Before placing your pearls back in the jewelry box, wipe them gently with a soft cloth. Never use an ultrasonic cleaner on your pearls. It can damage their nacre. Occasionally wipe your pearls gently with a cloth dipped in mild, soapy water. Then rinse the cloth in fresh water and wipe the pearls clean. Dry them with a soft cloth. If pearls come into contact with an acid substance such as fruit juice, vinegar, or other chemicals, immediately wipe clean with a soft cloth. 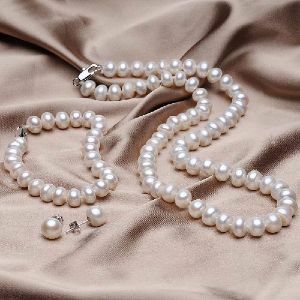 Be careful not to submerge your pearls in water as this will weaken the silk thread.